Greens Bar & Kitchen has been a Winchester institution for almost 30 years. A reliable, local venue in the heart of the city, this family run bar and kitchen continues to adapt and evolve. Serving fresh and hearty homemade food, a cracking breakfast and a delicious lunch daily, we aim to provide a casual atmosphere. Warm and friendly service is at the heart of our business – where everyone is welcome. Perfect for celebrations or just unwinding with friends, Greens Bar & Kitchen offers a lively night time, with a full bar and hand-crafted cocktails, made to order. We try to offer something for everyone and we are proud to be serving this city. Special offers on Monday, Tuesday & Wednesday. Celebrate the new week beginning with selected cocktails for only £6 from 5pm! Just a little gift from us to make the start of the week more bearable! Celebrating the best of British. Premium, hand crafted Gin with a top quality tonic. Half way to the weekend! 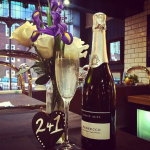 Celebrate with two for one on Prosecco, available ALL day! Come and try our different menus that we offer. 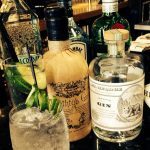 A sophisciated evening full of top shelf Gins & exciting flavours of tonic. A taste of the festive season. Get ahead of the game and book your Christmas Party with us! Having a celebration with us? Perfect party bites to accompany your drinks! Resident DJ - first Saturday of every month, old & new house music, dont be the one to miss out! Enjoy the new season's release on 21st November 2019! Serving breakfast and lunch with a glass (or two) of Beaujolais nouveau! Whether it's a small drinks reception or a five course dinner for 60, we've got you covered. Join the Greens team for the busiest night of the year! Our upstairs room is available for private hire and dining. 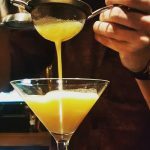 Everything from cocktail classes for hen parties, to Afternoon Tea for a special celebration! Fancy a celebratory sit down meal? Bespoke menus can be written for you. We also offer canapé and buffet menus for less formal occasions. Better still, there's no hire charge when dining privately with us. Enjoy the ambience of our bar but want an exclusive area for your party? Our back section can be reserved for parties without hire charge. Chose from party bites or a buffet to accompany your drinks. Drinks only? If we can fit you in, its all yours!